Having turned their backs on the aunt they’d never known, sisters Piper and Frances take a little trip down memory lane. The issue opens on a flashback that gives some insight into what actually happened on the day their mother seemed to lose her mind. From that revelation, we follow the sisters on a tour through their old house, long abandoned. While Piper and Frances try to make sense of the gaps in their memories, the discovery of their mother’s old journal helps them to fill in some of the blanks. 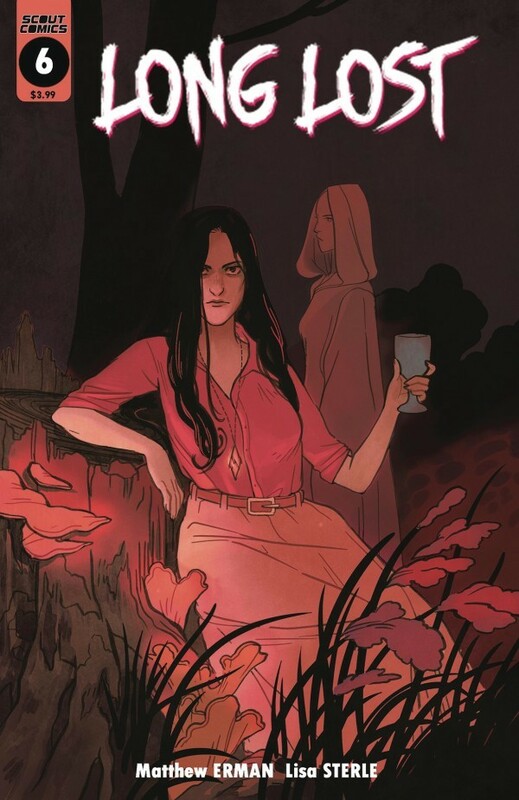 Back when I posted a review for Long Lost’s first few issues, I thought it was going to be a bizarre Twin Peaks kind of story… nothing outlandish or overt, but with enough subtle twists to keep a reader searching for the underlying layers. Holy crap was I ever wrong. The opening issue was seeded with carefully placed Easter Eggs in the background, seeming to follow the sisters around their home town of Hazel Patch to establish a quietly disturbing vibe. As the story progressed, subtlety went out the window and was replaced with secret societies and pagan rituals. 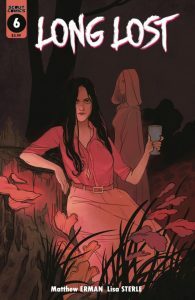 Issue six seems to be turning a corner as Piper and Frances start to come to grips with their roles. Matthew Erman has crafted a story that feeds out just enough line to hook an unsuspecting reader into his dark and twisty world. The story has spun webs out into its setting, at first seeming to be at random but proving later to have been deliberate and calculated. Erman’s greatest feat so far has just been in his ability to string readers along without them ever realizing the chaos that was lurking just out of sight. The characters of Piper and Frances are flawed enough to be interesting, and quirky enough to remain likeable. Lisa Sterle’s artwork has all of the characteristics of a nice, quiet comicbook… about best friends and puppies (oh hell, forgot about Piper’s missing dog… sorry) and afternoon tea. And then she slaps the reader upside the head with a slab of rotting meat you only hope might be some leftover ham hock. It’s a great contradiction, the unassuming style being used to camouflage an underlying gothic horror about family secrets and obligations. Fans of the horror genre looking for something a little more subtle might want to dive into this title and see where it takes them. The slow burn Long Lost started with has begun to build up to something that shows the promise of legitimate chills. If you’ve already been reading the title, think about going back and bingeing through it again… the rabbit hole is coming up fast, and you’re gonna want to jump into it with fresh eyes.